An iris is a flower that is usually blue, purple, white and/or yellow in colour. The ornamental bloom is native to Eurasia and North America. The name ‘Iris’ originated from Ancient Greek Mythology. The goddess who personified the rainbow was named Iris. The legend says that irises were planted over the graves of women. By doing this, Iris was summoned to help guide said women on their journey to heaven. The Egyptians adopted this legend in their own way; Irises have commonly been depicted in Egyptian palaces. With a history like that, it’s easy to see why the iris is still a bloom of stature in the 21st century! The stately iris flower is known for having the meaning of royalty. It also represents wisdom and respect, which makes for the perfect of appreciation. The iris flowers are bedded in moss and ruscus in a stylish cement pot. 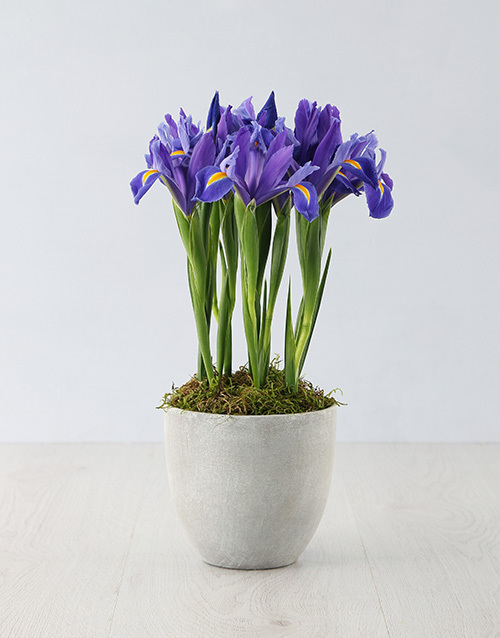 Show a loved one your appreciation by sending them this stunning Stately Irises In a Cement Pot. Among other things, the Iris is the birth flower of February, the national flower of France and is the 25th wedding anniversary flower. Some of the most common meanings of the flower include royalty, faith, wisdom, hope, and valour. So, the iris is beyond a doubt a popular flower choice for nearly every occasion. Forget ‘Starry Starry’ night, the ‘Irises’ paintings by Van Gogh and Monet are truly the stars of the show. 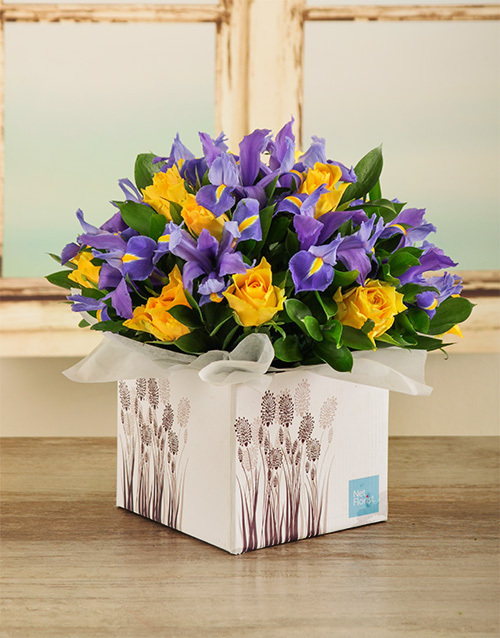 Much like their painting equivalents, this stunning artistic arrangement of Irises and yellow roses in a special occasions gift box, will steal the show for any and every occasion! Spoil a loved one with this breath-taking arrangement from NetFlorist today! Plant them in a sunny spot, in late summer. The plant needs to be planted in well-drained soil and so, it must get at least 6 hours of direct sunlight a day. Prepare their beds. Low-nitrogen fertilizer is recommended. The soil also needs to register at a pH level slightly less than 7 (neutral). A granular fertilizer should be used twice a year – in early spring. Air to breath. A beared-iris needs good air circulation. Plant them about 40-45 cm apart from one another. No mulch! Mulching retains soil moisture. This is the last thing you want for your iris plant. The good news is that the iris is therefore also drought-resistant! Don’t trim iris leaves. Don’t trim iris leaves after they have finished blooming. Leaves carry on photosynthesis for next year’s growth. You can, however, cut off the brown edges of the leaves. Transplant. After 2-5 years clumps might become congested and stop blooming. Divide and transplant the rhizomes in fresh soil. The best time to replant irises is straight after bloom. Show someone special how much you care with this gorgeous White Tulip Pot Treat. 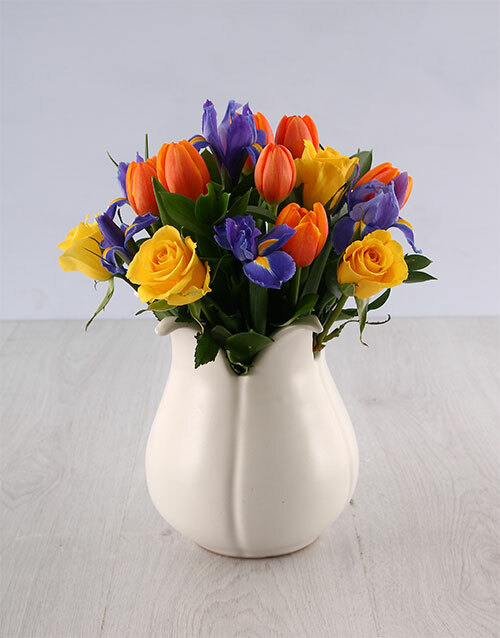 A vibrant arrangement of yellow roses, orange tulips, blue irises and ruscus is displayed in an elegant white tulip pot which will certainly be the focal point of any setting. Make someone smile and send this floral arrangement with NetFlorist! See more: TULIPS ARE BETTER THAN ONE!